Early-stage investing carries a high degree of risk. To help minimize that risk, the Keiretsu Forum members have developed a thorough and comprehensive due diligence process that is applied to all companies prior to member investment. The due diligence process is now available in The Keiretsu Forum Due Diligence Process Handbook, which represents more than 15 years of knowledge and best practices vetted by over a 2,500 Keiretsu Forum investor members world-wide. Like all investing, startup investing benefits from a disciplined approach. The Keiretsu Forum Due Diligence Process Handbook provides members and other investors with a process to conduct due diligence efficiently, as well as a valuable education and informational resource. Research clearly shows that investments made following a thorough due diligence process have significantly better outcomes than those made following less due diligence. 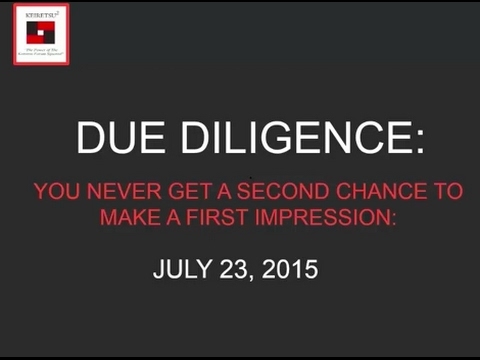 The Due Diligence Process Handbook is accompanied by an investor training webinar entitled "Decisive Due Diligence: The Fast Track to Decision and Influence." It is designed to help guide investors in using the Handbook to its full potential. The Keiretsu Forum is pleased to offer our member-designed Due Diligence Handbook free of charge as both an iBook for iPad and a downloadable PDF to benefit startup investors and entrepreneurs around the world. We hope this resource will serve as a valuable tool in supporting your own due diligence efforts.